The rising prevalence of childhood obesity in most developed countries is well recognized,1 as are the many short-and long-term complications that can occur as a result.2 The past decade has seen a rapid growth in research into various aspects of this epidemic. However, in most countries, there has been a far slower response in terms of the number of funded policies and services aimed at preventing and treating childhood obesity. What strategies should be implemented? In this issue of CMAJ, Harris and colleagues3 report the results of a systematic review of randomized controlled trials and controlled clinical trials designed to determine the effect of school-based physical activity interventions on body mass index among children.3 The 18 included studies mainly targeted elementary school children and covered a range of interventions, including moderate to vigorous physical activity, increased school time for exercise, and weight bearing exercises. Their meta-analysis showed that specific physical activity interventions did not result in additional improvements in body mass index compared with existing physical activity curricula. Several explanations for this lack of association are suggested by the authors, including an insufficient “dose” of physical activity, possible poor adherence to the planned interventions, inherent limitations of using body mass index as a measure of body composition and the possibility that dietary modification may have a greater influence on body composition than physical activity. Importantly, the authors comment that the results of their systematic review should not negate the importance of promoting physical activity in schools. They rightly point out the many other health benefits from school-based physical activity, including improvements in bone mineral density, blood pressure, lean muscle mass and aerobic capacity. However, their results raise questions about tackling the epidemic of childhood obesity: What is the optimal approach to prevent obesity? How can children already affected by obesity best be helped? Appropriate investment in the prevention of obesity is only one part of a response to childhood obesity. Given the large number of affected children in many countries, there is an urgent need for the provision of effective treatment services. This is where there is a major role for physicians, particularly those working in primary care or pediatrics. For example, regular monitoring of children's height and weight and the use of body mass index–for age charts can help physicians to recognize overweight or obese children, and the issue can be raised sensitively with the children or their families.6 The principles of childhood obesity treatment are well established (Box 1). Despite our increased understanding of the elements of obesity treatment, no health system has yet developed a sustainable and coordinated model of clinical service delivery for treatment of obesity that allows access for children and their families to affordable and effective primary, secondary and tertiary programs of care. Nor does any health system have a health workforce that is, as yet, sufficiently trained to cope with the clinical load of obese children and their families. Such a situation raises the urgent need for clinicians, researchers and health administrators to develop, evaluate and implement workable approaches to providing effective clinical care for the many children and young people affected by obesity. School-based physical-activity programs do not decrease the prevalence of childhood obesity, but they are associated with a range of other health benefits. Multilevel, whole-society strategies for physical activity and food intake are needed to tackle obesity. Children and young people affected by obesity need effective treatment interventions that include family physicians and pediatricians. No health system has implemented a sustainable and coordinated model of delivery for services for obesity prevention and treatment. Lobstein T, Baur L, Uauy R; for the IASO International Obesity TaskForce. Obesity in children and young people: a crisis in public health. Obes Rev 2004;5(Suppl 1):4-104. Harris KC, Kuramoto LK, Schulzer M, et al. Effect of school-based physical activity interventions on body mass index in children: a meta-analysis. CMAJ 2009;180:719-26. Butland B, Jebb S, Kopelman P, et al. Foresight. Tackling obesities: future choices — project report. London (UK): Government Office for Science; 2007. Available: www.foresight.gov.uk/Obesity/17.pdf (accessed 2009 Feb. 25). Czernichow S, Maillard-Teyssier L, Vergnaud AC, et al. Trend towards a stabilization of obesity prevalence in France: a population-based study, 1995–2005 [abstract]. Int J Obes 2008;32(Suppl 1):S32. Kipping RR, Jago R, Lawlor DA. Obesity in children. Part 1: Epidemiology, measurement, risk factors, and screening. BMJ 2008;337:a1824. Oude Luttikhuis H, Baur L, Jansen H, et al. 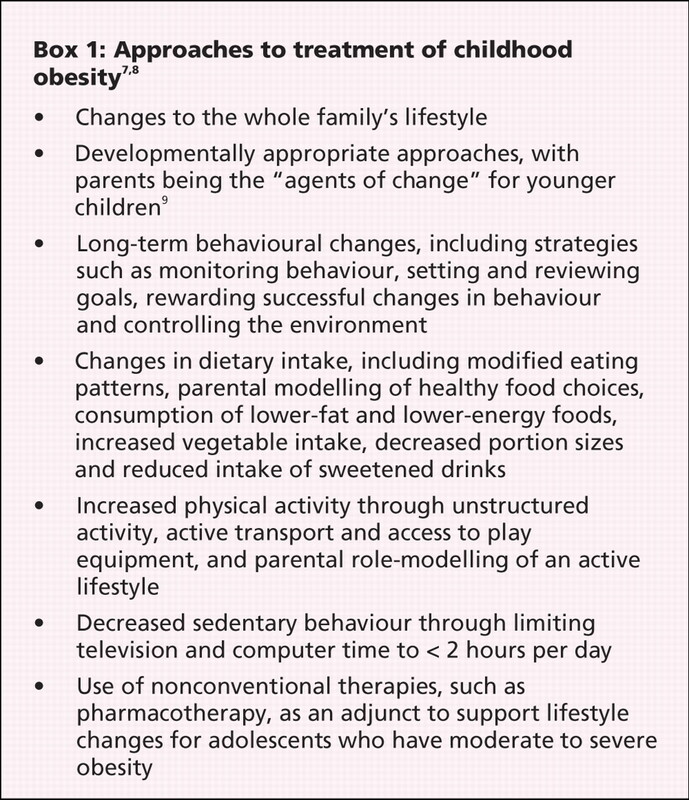 Interventions for treating obesity in children. Cochrane Database Syst Rev 2009;(1):CD001872. Dietz WH, Robinson TN. Clinical practice. Overweight children and adolescents. N Engl J Med 2005;352:2100-9. Golan M, Crow S. Targeting parents exclusively in the treatment of childhood obesity: long-term results. Obes Res 2004;12:357-61.